Glenn Lewis, Sub Rosa, 2019. Glenn Lewis: The Poetic Process is a conceptual work that opens a space for conversation between two media: ceramics and photography. 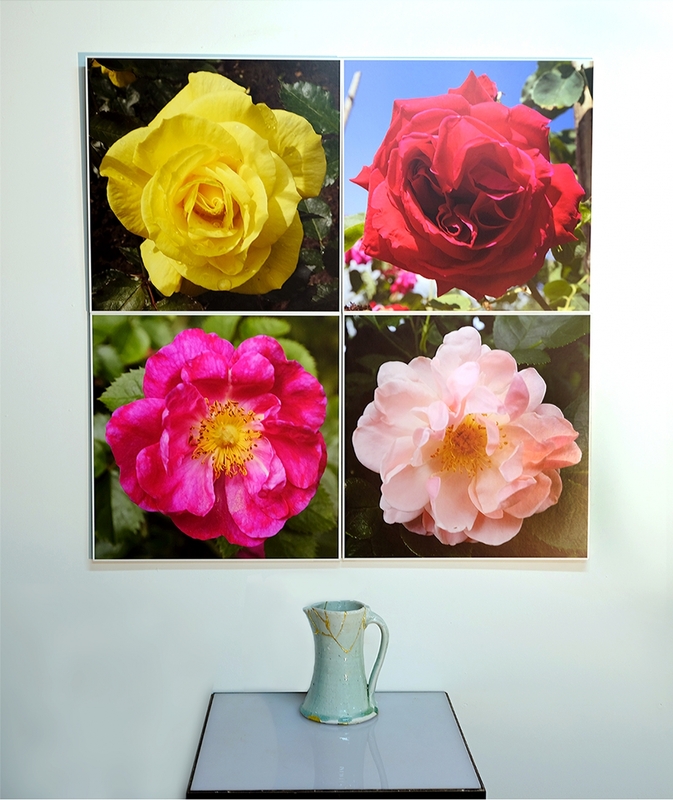 Presented for the first time at the Gardiner Museum, this installation combines a series of five pots made during a residency at the Leach Pottery in St. Ives, England, and 20 large-scale photographs of roses taken in German and English gardens. The juxtaposition reflects on the long history and symbolism of the rose and vessel form: two dominant motifs and shapes from medieval Europe when art and craft were still creatively united. Lewis’ work asks viewers to look closely. His photographs reveal the details of the blooms—pollen, dewdrops, and petals—tempting viewers to approach and smell them. The vessels’ surfaces are also inscribed with a history. When Lewis unpacked the pieces in Vancouver, he discovered that they were damaged. Rather than discard them, he mended them using the Japanese technique of kintsugi, an art of mending by which the breaks are not hidden but revitalized through the use of gold. The artist thus encourages viewers to see beauty in imperfections. The installation also comprises a series of ceramic tiles printed with Lewis’ photographs of fragrant roses.